Thallus: crustose, warted-areolate, warts often coalescing to form a rimose crust areoles: rounded to irregular in outline, 0.05-0.15 mm in diam., moderately to strongly, often irregularly convex, ecorticate but sometimes with a loose unorganised alga-free layer of various hyphae surface: yellowish or greenish beige to gray, dull, esorediate Apothecia: irregularly rounded, rarely flexuose in outline, mostly densely crowded, rarely single or in small groups, sessile with a constricted base, 0.55-1.05 mm in diam. disc: pinkish beige to orange-brown, rarely with a green tinge, flat to weakly, rarely moderately convex, white or pale pink pruinose margin: yellowish green to pinkish gray, usually same color as thallus, weakly to strongly prominent when young, persistent, rarely excluded with age, often granular-knobby, strongly pruinose, without a parathecial ring amphithecium: present, outermost parts (15-30 µm) mostly algal-free and composed of strongly gelatinized hyphae, with an algal layer, especially pronounced near parathecium and intergrading with parathecial hyphae, laterally 45-90 µm wide, basally 35-120 µm wide, filled with small brownish granules, with irregularly entangled, short-celled hyphae with lumina 1-1.5(-2) µm wide, outermost hyphae relatively thick-walled, with lumina 1.2-2.5 µm wide, ecorticate parathecium: hyaline, composed of short-celled hyphae, (5-)10-30(-45) µm wide epihymenium: ochre, often sordid or with a green tinge, ±finely granular (soluble in K), 5-15(-20) µm high hymenium: hyaline, (35-)40-55 µm tall; paraphyses: hyaline, weakly branched and anastomosing, with lumina basally 0.7-1 µm wide and apically 1-1.5 µm wide; subhymenium: hyaline, 25-75 µm thick; hypothecium: hyaline, 45-90(-160) µm thick asci: clavate, 8-spored ascospores: hyaline, simple to rarely 1-septate, ellipsoid, (7-)7.8-10(12) x (3-)3.4-4.2(-5) µm Pycnidia: not observed Spot tests: thallus and parathecium K-, C+ orange, KC+ orange, P- Secondary metabolites: usnic acid, zeorin, thiophanic acid, arthothelin, 4,5-dichloronorlichexanthone, ±4-chloronorlichexanthone and ±norlichexanthone (tr.) Substrate and ecology: ±endosubstratal, on bark of shrubs and trees, distinctly oceanic Sonoran distribution: Baja California and southern California sea level to 480 m. Notes: Lecanora substrobilina is characterized by its distinct anatomy of its apothecial margin with a parathecium of densely entangled, gelatinized, short-celled hyphae covering the algal layer of the margin. 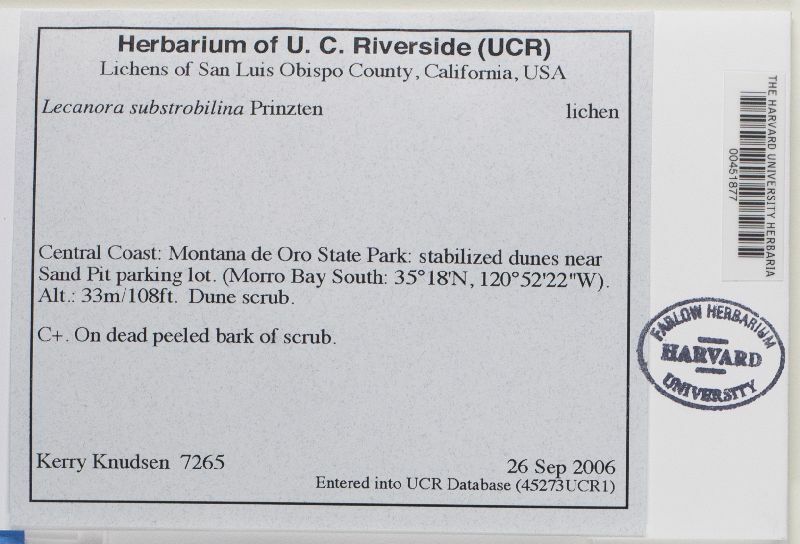 The parathecium is somewhat similar to that in L. sublivescens (Nyl.) A. L. Sm., where it is more strongly developed and forms a more or less biatorine margin. For further distinguishing characters of L. substrobilina see under L. confusa, L. perconfusa and L. strobilina.